Now that my kids are getting a bit older and are asking for things like Popsicle I really am starting to think about how much I give them and what I give them. 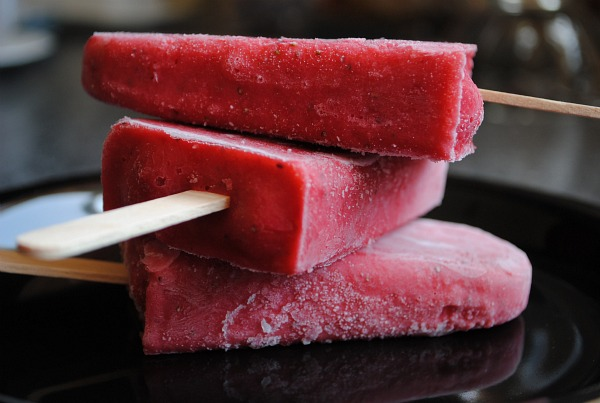 When I found this recipe I was so excited to be able to make Popsicle from fresh fruit where I could control the ingredients that were in them instead of store bought where who knows what is in them. You can use regular yogurt, light yogurt or even Greek yogurt for this. Not to mention you can control the sugar content based upon how sweet your fruit is and how sweet you want the Popsicle. I froze mine in Dixie cups so they were the perfect size for the kids. Run under cool water and they slip right out of the cup when you are ready to serve. 1. Wash strawberries and cut stems off. Place in blender along with yogurt, sugar, and water. Blend until smooth. 3. Place in freezer until firm and insert Popsicle sticks in the center of the Dixie cups. Continue to freeze until frozen, about 4-5 hours. 4. To serve run Dixie cups under cool water until Popsicle pulls out of the cup. Have I ever told you how much my husband loves ice cream? I think I have said it a time or two. It is one of his favorite things and he could eat it morning, noon, or night. He has been playing around with our ice cream maker and this time I think he found a great recipe. It remind us of Ben & Jerry’s Coffee Toffee Crunch ice cream. To make it even better next time we are going to add in some chopped up toffee chips or Heath bar. 1. Whisk together milk, instant coffee granules, sugar, and salt in a large bowl until sugar is dissolved. Stir in the heavy cream, then cover and refrigerate until chilled, at least 2 hours. 2. Pour the chilled mixture into an ice cream maker and freeze according to the manufacturer’s directions. Pour in the caramel sauce in just before your ice cream reaches the soft serve consistency. Enjoy! So I am sure I have stated this before but my husband is obsessed with ice cream or almost any variation of it. Ever since we got our ice cream maker he has been making ice cream at least once a week and then topping it with all kinds of goodies. Now I am a bit jealous because he can eat all the ice cream he wants and not even gain a pound and maybe even lose a pound. Me however can gain a pound just by looking at the ice cream much less eating it. 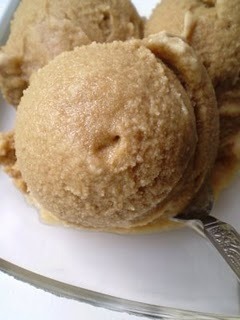 But when you make it at home and you can control the ingredients you can get a healthier version of ice cream. 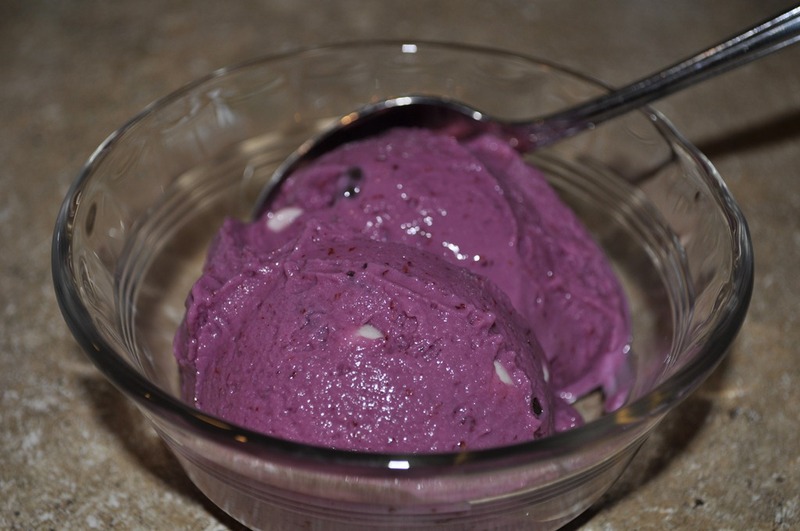 For example this recipe is frozen yogurt and uses Greek yogurt which is not bad for you in moderation. On top of that using fresh blackberries gives it so much flavor and you even get a bit of chocolate in this recipe. Enjoy! 1. Combine yogurt, 2/3 cup sugar and vanilla in a large bowl, preferably one with a pour spout. Refrigerate for 1 hour. Meanwhile, puree blackberries in a blender or a food processor. Strain the blackberries using a fine mesh strainer, then stir in the remaining tablespoon of sugar. Refrigerate for 1 hour. 2. Add blackberry puree to the yogurt mixture and stir until combined. Freeze in an ice cream maker according to the manufacturer’s directions. To add the chocolate you can add it once the yogurt is about half way done freezing so that they don’t all fall to the bottom or you can mix in after the frozen yogurt is done freezing. Place in an airtight container and freeze until firm. My husband loves ice cream. Almost any kind and any time of year, even in the dead of winter! We finally broke down and got our selves an ice cream maker. One of the ones that doesn’t use ice and salt so there isn’t much mess and it makes the ice cream in like 20 minutes. 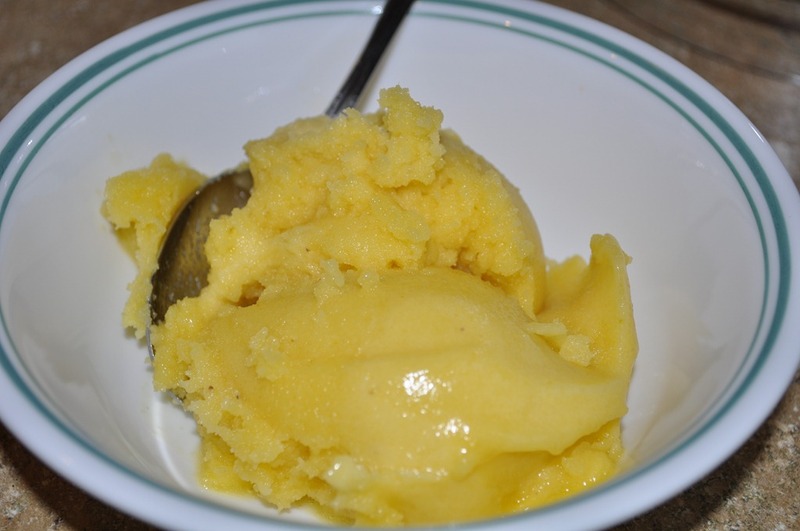 Our first attempt was this Tropical Fruit Sorbet. It was such a refreshing dessert and besides the sugar was all fruit. This sorbet will not disappoint! 1. Cut the banana, pineapple, and mango into small chunks. Add to the blender, along with the orange juice, sugar, rum, and lime juice. Puree until very smooth. 2. Chill the mixture thoroughly and then freeze it in your ice cream maker according to the manufacturer’s instructions.